Other questions almost answer this question. What is the purpose of the flange on the wax ring? I can purchase a ring with or without the flange. How do I know whether to get the standard ring or the thick ring? I really don't like the idea of trial and error. 1) A leak may not show up until just after I've concluded that there are no leaks. How tall the ring is depends on how close the toilet's outlet horn is to the flange. Under ideal conditions, the standard ring is just a bit too tall so that it compresses just enough to form a good seal without squeezing out into the drainage path and causing an obstruction. Toilets with more than normal spacing will need a taller ring to achieve a proper seal. But if you use a tall ring without the flange on a properly spaced toilet installation, excess wax will be squeezed into the drainage path, causing an undesirable obstruction. This is why double height rings are often sold with flanges, the flange keeps the wax out of the drainage path. But the flange itself is a bit smaller than the outlet pipe, so it forms a bit of an obstruction itself. Thus, it's not something you want to use unless there's a good chance you'll need it. You can estimate which height ring is needed and if a flange is a good idea or not by placing a straight edge along the base of the inverted toilet and measuring from the straight edge to the ceiling of the toilet base. Adjust this measurement by how high or low the floor flange surface is from finished floor. The wax ring should be compressed around 1/2 to 3/4 it's initial height once installed. If it will compress less, you need a taller ring. If it will compress more, consider getting one with a flange to limit wax extrusion into the drainage path. I always purchase the extra-thick ring with the flange. The cost difference is not that great. The flange helps to ensure that the ring is centered over the flange in the floor and to direct the waste into the pipe. More wax in the ring helps ensure a good and thick seal. The purpose of the flange on the ring itself is to help guide installation and to keep excess wax from obstructing the drain. 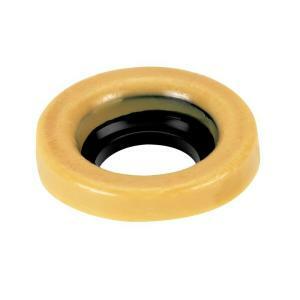 Yes you can buy a wax ring with or without the attached plastic "guide" flange at any home improvement store. The flange is supposed to sit on top of the floor, but sometimes people remodeling a home install flooring on top of original flooring, causing the flange to be recessed. I guess a thicker wax ring would help counteract this, but if this is the case you should get a floor flange extender. You don't know what you have until you get the toilet up. Just buy a regular ring, and if your flange is recessed in the floor get a flange extender. The flange on the wax ring has the purpose of flashing the toilet protecting against leaks, guaranteeing that water can not escape when there is not a blockage. The cone on the bottom of the toilet sets in the cone of the wax seal creating a propor flashing against water intrusion. Using a thick enough wax seal allows for a proper seal against back-ups. I couldn't believe anyone would not use a wax ring with a flange during an installation as a roofer it seems completely idiotic. Not the answer you're looking for? Browse other questions tagged toilet or ask your own question.